On March 9, the St. Helena Historical Society will host its 3rd Annual ‘History Becomes Art’ event to showcase and auction artwork inspired by photographs from the town’s past. The event, held at The Gallery at Brasswood Estate from 1:00pm – 4:00pm, features auctioneer Devon Bell, artisan hors d’oeuvres, wine, and live music. 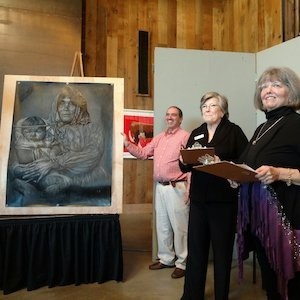 Artwork from 19 local and acclaimed artists will be auctioned during the event, including works by Thomas Arvid, Layla Fanucci, Carolynne Gamble, Gordon Huether, Dinah Cross James, and more. Each artist selects an image from a curated collection of antique St. Helena photographs and creates a work of art inspired by the image. All proceeds from the auctioned artwork will benefit the St. Helena Historical Society’s effort to create a permanent, public gallery space to showcase its diverse collection of cultural objects.